A view of the Beta Pictoris system taken with the European Southern Observatory's 3.6-meter telescope and the NACO instrument on ESO's 8.2-m Very Large Telescope, which hosts the youngest exoplanet ever weighed. The planet, Beta Pictoris b, is 226 times younger than the Solar System, at 20 million years of age. Astronomers have measured the mass of a very young alien planet for the first time, thanks to more than two decades' worth of data collected by two of the European Space Agency's star-mapping satellites. The exoplanet — known as Beta Pictoris b — is a gas giant like Jupiter, but scientists estimate it is nine to 13 times more massive than our solar system's biggest planet. 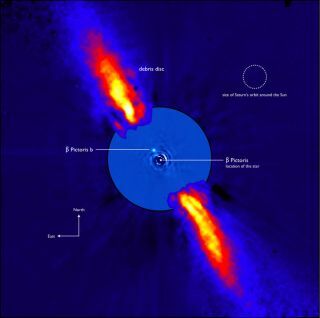 Discovered in 2008, this exoplanet orbits the star Beta Pictoris, the second brightest star in the constellation of Pictor. Instead, the weight of Beta Pictoris b was calculated based on the position and motion of its host star in the sky over a long period of time, according to a statement from ESA. "The star moves for different reasons," Ignas Snellen, lead author of the study and astronomer from Leiden University, the Netherlands, said in the statement. "First, the star circles around the center of the Milky Way, just as the sun does. That appears from the Earth as a linear motion projected on the sky. We call it proper motion. And then there is the parallax effect, which is caused by the Earth orbiting around the sun. Because of this, over the year, we see the star from slightly different angles." Researchers measured the star Beta Pictoris' path across the sky and minuscule wobbles caused by an orbiting baby planet, a process called astrometric measurement. The researchers also detected "tiny wobbles" in the star's motion, which means the star deviates from its expected course due to the gravitational pull of Beta Pictoris b, according to the statement. "We are looking at the deviation from what you [would] expect if there was no planet, and then we measure the mass of the planet from the significance of this deviation," Anthony Brown, co-author of the study and researcher from Leiden University in the Netherlands, said in the statement. "The more massive the planet, the more significant the deviation." However, in order to accurately estimate the mass of Beta Pictoris b, the researchers needed to collect observations over a long period of time. This required combining data from the Gaia spacecraft (launched in 2013) and the ESA's Hipparcos satellite, which studied Beta Pictoris 111 times between 1990 and 1993. Combining measurements from the two spacecraft revealed that the infant exoplanet is between nine and 13 times more massive than Jupiter, according to the statement. "By combining data from Hipparcos and Gaia, which have a time difference of about 25 years, you get a very long-term proper motion," Brown said. "Hipparcos on its own would not have been able to find this planet, because it would look like a perfectly normal single star unless we had measured it for a much longer time." The findings were published Aug. 20 in the journal Nature Astronomy.